1. 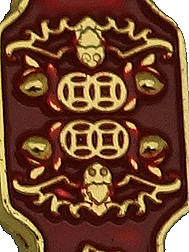 The head of the ruyi is adorned with five bats denoting "Five Blessings", namely longevity, wealth, health and composure, virtue and longevity. 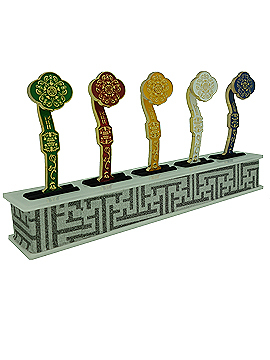 The reverse side of the ruyi is filled with auspicious symbols of mystic knot and consecrated with the sacred "Wishfulfilling Mantra" (OM PADMO USHNISHA VIMALE HUM PHAT) to enable the fulfillment of your wishes. 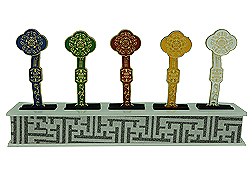 What Ru Yi symbolizes and how to display this object? Originally, the Ru Yi was a short sword made from iron and used by ancients for self defence and for purposes of gesticulation. Later it evoluted to become a present to signify good wishes to the recipient. Some claimed it was used as a pointer of directions and others said it guards against anything unexpected. The shape was derived from lotus and some even claimed it was derived from ling tzi, a special curative fungus that cures a thousand diseases. 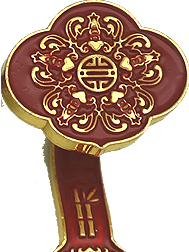 The head of the Ru Yi is also a strong resemblance of a bat which brings fortune and good luck. 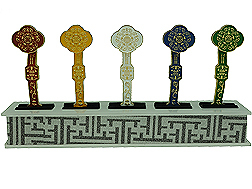 Ru Yi symbolizes authority and power in the imperial courts and royal assemblies. 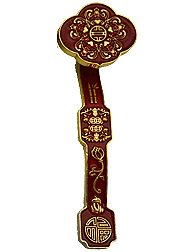 The Ru Yi was later being regarded as the sceptre for Imperial courts and offices, which was used by high ranking government officials including empresses. 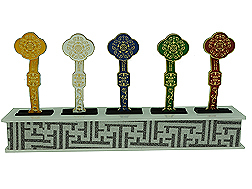 Ru Yi has auspicious meanings: smoothness in endeavours and enhanced luck in undertakings. Ru Yi is also a potent symbol carried by the Tua Peh Kong, Laughing Buddha and one of the Fuk Luk Sau (3 Star Gods) and many other deities for blessings. 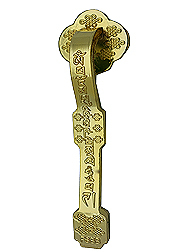 The symbol is most suitably used to bring our career to greater heights and raise the bar for authority. The item can be displayed to ensure we get enough control over subordinates at work, increase our influential power and also if we have rebellious children. 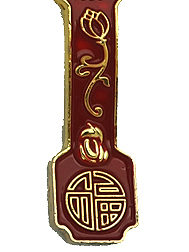 The Ru Yi can also protect you from evil, harmful people and misfortune. What are the benefits of Five Elements? Five Elements (wood, fire, earth, metal, water) correspond to Five Directions (north, south, east, west, center) and Five Planets (Mercury, Venus, Mars, Jupiter, Saturn). The Five Elements play the key to bringing out greater wealth potential. 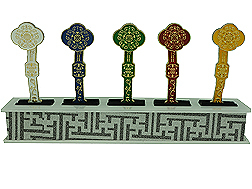 The presence of all the five elements will be beneficial for unbalanced "personal bazi chart" and "annual bazi chart", where by having them it will bring the basket of elements back into balance so that wealth and good fortune can manifest. There can be some kind of fortune meltdown when personal and annual charts are unbalanced, unless the deficiency of any element is remedied. 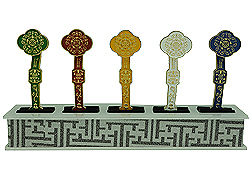 In short, these ruyi balance out your personal elements when yours go out of sync. The Ruyis have many uses? 1. Display them in the West (family luck corner) to enhance your authority in the family, especially over your children who are rebellious. 2. Display them in the Northwest of your living rooms or family rooms to energize your mentor luck. This will bring in helpful people and support from important people. 3. Display them in the north sector of your living room or work desk to improve your career luck and to enable promotional opportunities. They will help you gather more support from subordinates and peers, besides having more command over difficult employees. 4. For wives who are seeking more authority, control or say in the family or over your husbands, you can display them in the Southwest corner of your bedroom or living room or nien yen direction. How the Ruyis should be arranged in Different Directions?